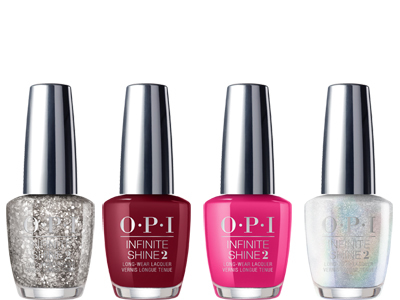 Featuring 12 new limited-edition shades and three perfectly coordinating Christmas glitters. Inspired by the latest film adaptation of the classic ballet, The Nutcracker and the Four Realms Collection consists of 12 new colours and three glitters in Nail Lacquer, Infinite Shine and GelColor formulations – and a first for OPI's Infinite Shine glitter hues. "This collection has something for everyone from light, wintry shades to rich, moody colours," states OPI Co-Founder and Brand Ambassador, Suzi Weiss-Fischmann. "There's so much inspiration in this classic ballet and now blockbuster movie. The visuals are spectacular. To add to this collection's drama, we now have glitters not only available in Nail Lacquer, but also in Infinite Shine and GelColor formulas for even longer lasting manicures! Glitter continues to be a top trend during the holidays, and these glitters are designed to be worn alone as well as mixed and matched with the collection's colours. Add to bare nails for a festive pop or create dimension by adding over colour for this celebratory time of year." In addition to the 12-colour collection, The Nutcracker and the Four Realms Collection includes three glitter shades. Three shades in gold Gold Key to the Kingdom, silver Dreams on a Silver Platter and rose gold I Pull the Strings can be worn alone or layered on top of a colour for a multidimensional look. With sweet sugar plum shades, the collection includes deep red Candied Kingdom, fuchsia Toying with Trouble, and a gold foil wrapping Dazzling Dew Drop. Delicate floral hues in emerald green Envy the Adventure and purple Lavendare to Find Courage and Berry Fairy Fun offer contrast to rich, vintage carnival meets heroine soldier-inspired colours like maroon Ginger's Revenge, dark black shimmer Black to Reality and navy March in Uniform. Soft glacier blue Dreams Need Clara-fication, pearlescent silver-white Tinker, Thinker, Winker? And shimmering snowflake white Dancing Keeps Me on my Toes evoke a winter wonderland.